I love all kinds of crafting and especially like to try new techniques, but in my heart of hearts I'm a stamper. I adore the art of card making and am always excited to try out new stamps so I was pleased to recently be introduced to Market Street Stamps and their eclectic (I think you know how I feel about anything eclectic) design offering. Market Street Stamps are focused are delivering great design, high quality crafting products to their customers and having used their products I can testify that they do deliver upon their commitment. The one small difference about Market Street Stamps? Their peach tint! Why are they peach-tinted? Market Street uses trade-quality photopolymer, which means they only use substrate that professional printers use. And the peach? Well, that’s added by our manufacturer so you’ll always know when you have the best clear stamps on the market today. And it's a fun color, isn't it? The second thing people remark is how well Market Street Stamps stamp! The softer polymer allows the impression a bit of cushion, just like a wood-mounted red rubber stamp, which provides you with a cleaner stamped image….every time. All of the stamps are self-cling and if they attract any lint or dust, simply rinsing them through lukewarm water will allow them to regain their cling – just like new! Today we released four new sets along with a sale! Purchase any regularly priced set and take 25% off of one of the Market Street Stamps background sets, regularly priced at $12.50. What a great way to grab a combo set for less! When checking out be sure to enter code MSS0812 to receive your discount. This sale will run from 8/21/12 through 8/25/12. On today's card I used the new Growth set (I'm a sucka for nature inspired images) and paired the set with paper from Authentique (yes, that's from their Enchanted paper line but hey, it can work for fall cards too! ), and Kiwi Fruit buttons from Buttons Galore. My image was colored with Copics and I added a tiny bit of highlight with a white gel pen. 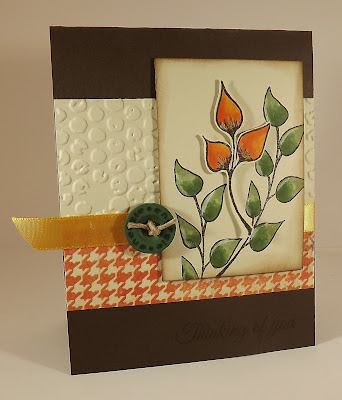 Beautiful card...and a lovely stamp set! This is so beautiful, Kim! I'm loving that new set and your coloring is awesome! !